Indian Cuisine to Dream About! 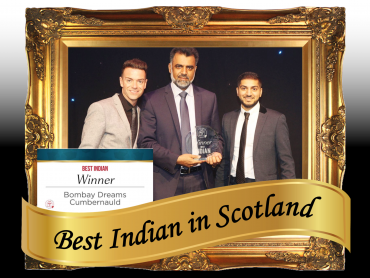 Welcome to Bombay Dreams, our multi-award winning restaurant. We have been serving Indian food in the Cumbernauld area since 2004 and as a result, we know what it takes to keep our customers satisfied and coming back for more! Our restaurant has a simple, yet effective ingredient for success; we only use quality ingredients in all our dishes, we ensure we operate with the highest levels of customer service and we expect all our staff to go out their way to provide our customers with a nice, relaxed environment, helping them make the most of their time with us. By putting the customer at the heart of everything we do, we have built up an extremely loyal customer base, that is growing all the time. So whether you are dining in with us or collecting a takeaway, you can rest assured that you will have a great meal. All our food is prepared and cooked in a hygienic and clinical environment. Thank you once again for supporting Bombay Dreams and we look forward to serving you! Don’t waste time trying to get through on the phone, order online for collection or delivery! Covering the whole of Cumbernauld, Bombay Dreams prides itself in being a favourite restaurant and takeaway for locals and regulars. Offering mouth-watering authentic Indian cuisine in a modern and relaxed atmosphere, the bar and restaurant is a perfect location for a delicious meal.